AGRIS November 2017 data release with 25,024 new records ! Inform all interested parties about AGRIS November 2017 data release with 25,024 new records (out of 9,099,370 records) ! Thank all AGRIS Contributors and Users ! The AGRIS team kindly invites eligible institutions to become an AGRIS data provider and to submit your data to AGRIS by sending an e-mail to agris@fao.org. (Note that AGRIS does not accept individual author contributions). In AGRIS you can contribute either as a repository - this is a case of a collection of bibliographic metadata created within a university or a research institution or a journal - or as an aggregator - i.e. an organization gathering metadata collections from many different institutional repositories. Please check whether the bibliographic information you would like to share with AGRIS falls in one of the main AGRIS categories. AGRIS receives metadata in various formats (Crossref, DOAJ (Custom), DOAJ, Endnote, MARC21, Mendeley, METS, MODS, PubMed, RSS amongst the others); the minimum elements being in AGRIS AP XML format or better. Please contact agris@fao.org for any further information on how to become an AGRIS center or on how to submit data! 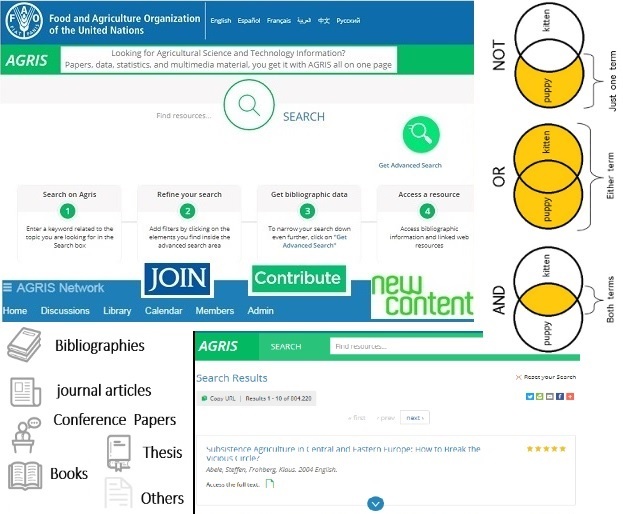 AGRIS (International Information System for the Agricultural Science and Technology) service aims to provide better access and visibility to the information resources in agricultural and related domains. AGRIS content comes from more than 350 data providers which include research centres, development programes, international and national organizations from more than 140 countries. 85 % of AGRIS records are indexed by AGROVOC and this enables similar content to be retrieved in Google.